Margaret Ethel May Cocker was born on 23 Feb 1879 in Evandale, Tasmania and died on 1 Dec 1918 in Mangana, Tasmania at age 39. Margaret married Walter Redburn on 17 Jan 1896 in Avoca Church of England. Walter Redburn was born 15 Nov 1867 at Morven, the son of convict ↑Mark Radburn/Redburn and Emma Green. He was registered as un-named Redburn in 1871 (no. 1042) and also registered as Walter Green in 1867 (no. 6292). Emma was the fourth child of convicts ↑Samuel Winsor Green and ↑Margaret Kirby who married in Tasmania on 1 Aug 1842. Walter died on 24 Jul 1941 in Launceston at age 73. On 22 Apr 1902 Walter was tried at Fingal for horse-stealing and sentenced to 12 months imprisonment. On 31 Jul 1903 he was charged with escaping from the Launceston Gaol and stealing at Longford for which he was sentenced to three years and six months. He was released on 1 Feb 1906. The full story of his crime, escape and trial are told here. 4-Ivy May Redburn was born on 24 Jul 1897 in Fingal, Tasmania and died on 21 Dec 1954 in Moorina at age 57. Ivy married Herbert Arthur Clark, son of John Joseph Clark and Emma Agnes Viney, on 10 Sep 1919 in St. Pauls Church of England, Derby. Herbert was born on 18 Jul 1896 in Ringarooma and died on 28 Jul 1986 at age 90. They had three children: Aubrey Horace, Oliver Mark and Norman Raymond. 5-Aubrey Horace Clark was born on 1 Aug 1920. 5-Oliver Mark Clark was born on 4 Oct 1922. 5-Norman Raymond Clark was born on 16 Dec 1933. 4-Elsie Maud Redburn was born on 1 Oct 1898 in Fingal, Tasmania and died on 15 Apr 1943 in Hobart, Tasmania at age 44. Elsie married Norman Boyd Hall, son of John Hall and Janet Henderson, on 17 Mar 1920. Norman was born on 21 Jun 1898 in Mangana, Tasmania and died on 9 Oct 1990 at age 92. They had two children: Josephine Ethel and Theodora Naldia. 5-Jospehine Ethel Hall was born on 9 Oct 1920. 5-Theodora Naldia Hall was born on 10 Feb 1923. Theodora married Walter Thomas. They had two children: Francis and Pat. 4-Leslie Joseph Redburn was born on 21 Aug 1900 in Fingal, Tasmania, died on 30 Apr 1972 in Burnie, Tasmania, Australia at age 71, and was buried in General Cemetery, Wivenhoe, Tasmania. Leslie married Dorothy Maude Singline, daughter of William Powell Singline and Anna Josephine Cotton, in 1933. Dorothy was born on 18 Nov 1912 in Derby, Tasmania and died on 5 Aug 2004 in Burnie, Tasmania, Australia at age 91. They had two children: Dorothy Margaret and Cheryl Lesley Ann. 5-Dorothy Margaret Redburn was born on 8 Dec 1933 in Ringarooma. Dorothy married Michael Costello on 10 Oct 1955. They had four children: Terence, Julie Lesley, Jennifer and Tony. 6-Terence Costello was born on 15 Jul 1956. 5-Cheryl Lesley Ann Redburn was born on 30 Sep 1947 in Burnie, Tasmania, Australia. Cheryl married Richard Riley. They had four children: Lynda, Sheree, Joanne and Richard. 6-Lynda Riley. Lynda married Darryl Baldwin. 6-Richard Riley. Richard married Angela. They had one daughter: Catherine. 4-Jack George James Redburn was born on 17 Aug 1903 in Ulverstone, Tasmania and died on 22 Apr 1970 in Brisbane, Queensland at age 65. Jack married Rose Elizabeth. Rose died on 21 Apr 2002. They had six children: Patricia Rose, Gloria Kathleen, Leslie James, Meryl Hope, Mercia Gertrude and David. 6-Patricia Rose Redburn was born in 1937. Patricia married Neil Eric Barwick. Neil was born in 1936 and died on 11 Oct 1984 at age 48. They had two children: Larry and Wendy. 7-Larry Barwick. Larry married Lyn. 7-Wendy Barwick. Wendy married Peter. 6-Gloria Kathleen Redburn was born in 1939. Gloria married Peter Lathouras. They had four children: Eleni, David, Maria and Anthony. 7-Eleni Lathouras. Eleni married Hedley Cook. 7-David Lathouras. David married Debbie. 7-Maria Lathouras. Maria married Craig Wells. 7-Anthony Lathouras. Anthony married Christina. They had one son: Samuel. 8-Samuel Lathouras. Samuel married Anna. 6-Leslie James Redburn was born in 1941. Leslie married Denise. They had two children: Jason and Andrew. 7-Jason Redburn. Jason married Samantha. 7-Andrew Redburn. Andrew married Joanne. They had two children: Maddison and Corbin. 6-Meryl Hope Redburn was born in Oct 1943 in Hobart, Tasmania and died on 11 Nov 1943 in Hobart, Tasmania. 6-Mercia Gertrude Redburn was born in Oct 1943 in Hobart, Tasmania and died on 11 Nov 1943 in Hobart, Tasmania. 6-David Redburn. David married Patricia. They had four children: Leah, Nathan, Drew and Brett. 7-Leah Redburn. Leah married Matthew Blackaby. 7-Nathan Redburn. Nathan married Fiona. 7-Drew Redburn. Drew married Jane. Jack next married Edna Doris. Edna died on 21 Dec 1977. 4-Roy Neil Redburn was born on 21 Apr 1905 in Fingal, Tasmania, died on 9 Sep 1993 in Launceston at age 88, and was buried in Kangaroo Flats, Victoria.He was usually known as Roy Neil Cocker as his father was not Walter. Roy married Ruby Maud Emma Eliza Wilkins on 26 Jul 1924. Ruby was born in 1910 and died on 1 May 1970 at age 60. They had two children: Irene Dorothy and Lila Camelia. 5-Irene Dorothy Redburn was born on 3 Jul 1925 and died on 19 Feb 1967 in Shepparton, Victoria at age 41. Irene married Ted Grundy. Irene next married Des Bywaters. 5-Lila Camelia Redburn was born on 11 Mar 1927. Lila married Jim Arnold. Jim was born on 3 Jul 1924. They had seven children: Rosalie Loness, John Charles, Lila Irene, Ruby Henrietta, James Hilary, Samuel William and Deidre Camelia. 6-Rosalie Loness Arnold was born on 12 Jun 1947. Rosalie married Ivan Henry Lawson on 12 Aug 1967. They had four children: Melissa Mae, Daniel Ivan, Mark Anthony and Rachel Louise. 7-Melissa Mae Lawson was born on 11 May 1968 and died on 18 Apr 1972 at age 3. 7-Daniel Ivan Lawson was born on 1 Aug 1969. Daniel had a relationship with Christine Whelan. They had one daughter: Abigail. 8-Abigail Lawson was born in Dec 1988. 7-MarkAnthony Lawson was born on 29 Jun 1971. 7-Rachel Louise Lawson was born on 10 Jan 1974. Rachel married Andrew Allen. They had one daughter: Kiara Louise. 8-Kiara Louise Allen was born on 21 Oct 1997. 6-John Charles Arnold was born on 6 Nov 1948 and died on 8 Nov 1948. 6-Lila Irene Arnold was born on 11 Jan 1950. Lila married Anthony Paul Bailey on 1 Aug 1981. They had three children: Simon Anthony, Michael Andrew and Kevin Phillip. 7-Simon Anthony Arnold was born on 29 Jan 1971 and died on 29 Jan 1971. 7-Michael Andrew Bailey was born on 6 Mar 1982 and died on 6 Mar 1982. 7-Kevin Phillip Bailey was born on 6 Mar 1982 and died on 6 Mar 1982. 6-Ruby Henrietta Arnold was born on 11 Feb 1951. Ruby married Maurice John Whelan in 1969. They had one son: Maurice John. 7-Maurice John Whelan was born on 1 Feb 1970. Maurice married Christine Rose Turner. They had one daughter: Brittany Rose. 8-Brittany Rose Whelan was born on 4 Aug 1995. Ruby next married Bevis Handley. They had two children: Gary and Irene. 7-Gary Handley was born on 3 May 1973. 7-Irene Handley was born on 24 Jul 1977. 6-James Hilary Arnold was born on 3 Feb 1952. James married Julie Anne Wurfal. They had three children: John Troy, Tammy and Bianca. 7-John Troy Arnold was born on 22 Mar 1979. John married someone. She had one daughter: Chelsea. 8-Chelsea Arnold was born on 12 Aug 2001. 7-Tammy Arnold was born on 31 Dec 1980. Tammy married someone. She had one son: Ethan James. 8- Ethan James was born on 19 Jul 2001. 7-Bianca Arnold was born on 29 Dec 1983. 6-Samuel William Arnold was born on 18 Jul 1953. Samuel married Delia O'Donnell. They had one son: Terrence William. 7-Terrence William Arnold was born on 16 Jul 1978. Samuel next married Lorreace. They had two children: Samuel and Susan. 7-Samuel Arnold was born on 6 May 1984 and died on 17 Dec 2001 at age 17. 7-Susan Arnold was born on 23 Jun 1986. 6-Deidre Camelia Arnold was born on 2 Sep 1955. Deidre married James Steven Gibson on 30 Oct 1976. They had three children: Matthew James, Timothy Arnold and Josephine Camelia. 7-Matthew James Gibson was born on 24 Apr 1977. 7-Timothy Arnold Gibson was born on 20 Mar 1979. 7-Josephine Camelia Gibson was born on 15 Jul 1982. Roy next married Gwen Shelton. Gwen died on 4 Apr 1990. 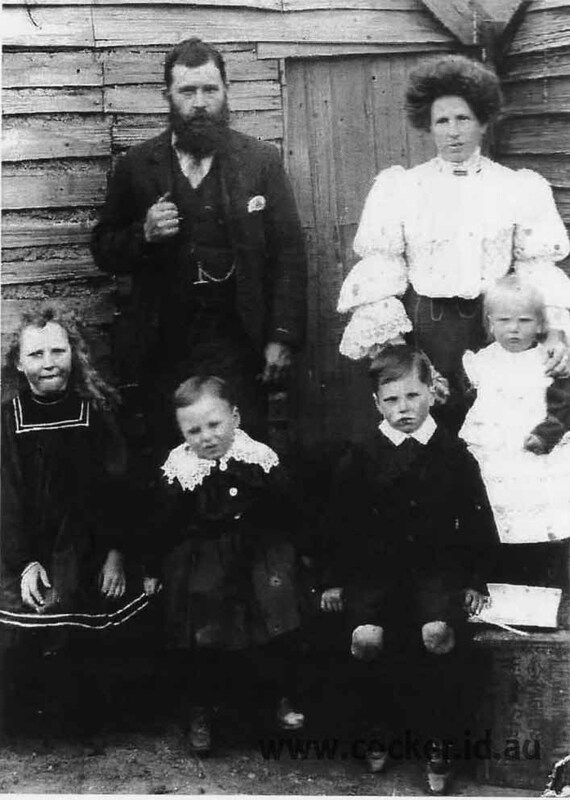 They had four children: Stanley Frederick, Desmond Roy, Loness and Sandra. 5-Stanley Frederick Redburn was born on 11 Jan 1934. Stanley married Beverley Margaret Wright on 22 Oct 1955. Beverley was born on 3 Jul 1937 and died on 4 Jan 1993 at age 55. They had six children: Teresa Maude, Bevan Stanley, Dale, Bernadette Sandra, Kelly and Darren Brendan. 6-Teresa Maude Redburn was born on 28 Aug 1955. Teresa married Maxwell Vivian Woodward on 28 Jun 1975. They had one son: Benjamin. 7-Benjamin Woodward was born on 30 May 1978. Benjamin married Carmen Cooper. Teresa next married Michael Larissey on 8 Oct 2000. 6-Bevan Stanley Redburn was born on 11 Mar 1957 and died on 9 Apr 1971 at age 14. 6-Dale Redburn was born on 5 Jun 1958. Another name for Dale is Mick. Dale married Lyn Curran. They had two children: Adam and Mark. 7-Mark Redburn. Mark married Julie Marsham on 10 Jun 2000. They had two children: Zackary and Emily Jayne. 8-Zackary Redburn was born on 24 Oct 2000. 8-Emily Jayne Redburn was born on 21 Apr 2001. 6-Bernadette Sandra Redburn was born on 25 Nov 1959. Bernadette married Tim McMohan. They had three children: Angie, Darren and Taylor. 7-Angie McMohan was born on 11 Apr 1977. 7-Darren McMohan was born on 28 Jun 1986. 7-Taylor McMohan was born on 22 Mar 1993. 6-Kelly Redburn was born on 14 Nov 1961. 6-Darren Brendan Redburn was born in Jul 1962 and died on 4 Sep 1962. 5-Desmond Roy Redburn was born on 18 Sep 1935 and died on 1 Dec 2001 in Launceston at age 66. Desmond married Eileen Joyce Carr. Eileen was born in Jul 1938 and died in Jul 1990 at age 52. They had five children: Karen, Anne Marie, Desiree, Kimmy and Vanessa. 6-Karen Redburn. Karen married David. 6-Anne Marie Redburn. Anne married Fred Clancy. They had one son: Dylan. 6-Desiree Redburn. Desiree had a relationship with Jeff Longstaff. 6-Kimmy Redburn. Kimmy married Michael Wells. They had two children: Alyce and Josef. 6-Vanessa Redburn. Vanessa married Kevin Chugg. They had two children: Kyle and Joel. Desmond next married Gail Saville nee Barrett. They had three children: Michelle, Lindy and Melissa. 6-Michelle Redburn. Michelle married Neville Burgess. They had three children: Kerrie, Luke and Jason. 6-Lindy Redburn. Lindy married Craig Perkins. 6-Melissa Redburn. Melissa married Peter. They had two children: Crystal and Liam. 5-Loness Redburn was born on 27 Jun 1938 and died on 9 Oct 1988 at age 50. Loness married Trevor Bailey. They had three children: Vicki, Sheree and David. 5-Sandra Redburn. Sandra married George Radford. They had five children: Shane, Wendy, Debbie, Peter and Murray. 6-Shane Radford. Shane married Teena. 6-Wendy Radford. Wendy married Rodney Bakes. Wendy had a relationship with Kevin. 4-Ernest Walter Redburn was born on 25 Mar 1907 in Fingal, Tasmania and died on 7 Dec 1939 in Hobart, Tasmania at age 32. 4-Nellie Irene Emma Redburn was born on 11 May 1909 in Tower Hill, Tasmania and died on 11 Oct 1919 in the Launceston General Hospital at age 10. 4-Charles Arthur Redburn was born on 9 Aug 1910 in Mathinna and died on 15 Aug 1995 at age 85. Another name for Charles was Digger. Charles married Fanny Shepherd on 8 Dec 1939. Fanny was born on 18 Jun 1918 and died on 31 Aug 1992 at age 74. They had five children: Richard Charles, Walter James, Dennis Rawdon, Karen and Christine. 5-Richard Charles Redburn was born on 20 Jan 1941 and died on 9 Feb 1956 in Cressy, Tasmania at age 15. 5-Walter James Redburn was born on 30 Dec 1942. Another name for Walter is Jim. Walter married Heather Hopwood. They had three children: Janelle, Craig and Kathryn. 6-Janelle Redburn was born on 23 May 1968. 5-Dennis Rawdon Redburn was born on 28 May 1945. Dennis married Veronica. Another name for Veronica is Bonny. They had two children: Linda and Lara. 5-Karen Redburn. Karen married Graham Stagg. They had three children: Kim, Nigel and Natasha. 5-Christine Redburn. Christine married Arthur Beckett. They had two children: Kye and Cindy. 4-Albert Joseph Redburn was born on 3 Jan 1913 in Fingal, Tasmania and died on 26 Aug 1919 in the Launceston General Hospital at age 6. 4-Jessie Alice Redburn was born on 14 Dec 1914 in Fingal, Tasmania and died on 18 Mar 1976 in Scottsdale at age 61. Jessie married Reginald Gordon Taylor, son of Charles Henry Taylor and Amy Maria Cruse, on 24 Dec 1931 in St. Pauls Church of England, Derby. Reginald was born on 1 Jun 1908 in Pateena and died on 26 Nov 1973 in Ringarooma at age 65. They had six children: Leslie, Nellie Alice, Charles, Margaret Joy, Lynette and Doreen Betty May. 5-Leslie Taylor. Leslie married Ruth Marshall. 5-Nellie Alice Taylor. Nellie married Des Bounday. 5-Margaret Joy Taylor was born on 4 Nov 1937. Margaret married Robert Ernest Mountney on 29 Aug 1956. 5-Lynette Taylor. Lynette married Reg Burr. 5-Doreen Betty May Taylor was born on 20 Aug 1940. Doreen married Simmons. 4-Winifred Ethel Redburn was born on 16 Nov 1918 in Mangana, Tasmania and died on 29 May 1980 in Scottsdale Hospital at age 61. Winifred married James Richard Crichton, son of Richard George Crichton and Elise May Stevens, on 14 May 1938. James was born on 10 Feb 1919 in Queen Victoria Maternity Hospital, Launceston and died on 1 May 1981 at age 62. They had three children: Malcolm, Valerie Jean and Eunice. 5-Malcolm Crichton was born on 25 Nov 1945. Malcolm married Glenyce Amos. Glenyce was born on 14 May 1945. They had one son: Brett Malcolm. 6-Brett Malcolm Crichton was born on 17 Mar 1968. 5-Valerie Jean Crichton. Valerie married Donald Arthur Walker. They had two children: Murray Leigh and Carol Ann. 6-Murray Leigh Walker was born on 6 Apr 1963. 6-Carol Ann Walker was born on 2 Jan 1965. 5-Eunice Crichton. Eunice married Graham Davis.